I know this has happened to you. You got this fabulous piece of meat (from the food market) and after getting it home you discover that you don't have all the ingredients to cook it. So, what do you do? Run back to the store and get the missing ingredients? Or, if you are done hunting and forging in the greater outdoors for the day, you just improvise. The latter is the choice I made for roasting my pork loin. I was out of yams, and we love pork loin with yams or sweet potatoes. However, all I had today were two medium size apples. At first I turned to the web for a pork loin recipe that did not call for yams. 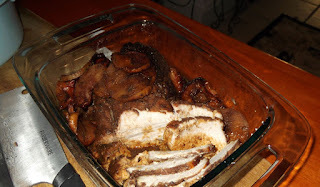 I found a few, but I wanted the sweet taste that the yams, brown sugar and apples gave the roasted pork loin. After looking at these wonderful recipes, I decided to wing it. Below is my pork loin alternative recipe for when the yams are missing. Preheat the roaster oven to 350 degrees F.
4. Next, season it with salt, butcher ground black pepper, pumpkin pie seasoning, and brown sugar. Don’t be afraid to be a little heavy handed with the pumpkin pie seasoning. 5. Spread apple butter over pork, and mix well with the other seasonings. 8. Also add the liquid from the pork and apple bowls. 9. Bake for 1 hour in the preheated roaster oven. Check for desired doneness. 10. Add a couple of small splashes of Sunny D to pork dripping and bask pork loin, once. 11. Roast another 30 minutes or until pork loin is tender. 13. Place them in a casserole dish; pour juice from roasting pan over them and cover. Talk about a fabulous tasting piece of meat. This pork loin recipe did the job. The apples were caramelized; the pork tender and juicy. The pumpkin pie seasoning with the brown sugar and juice made this recipe a favorable keeper.